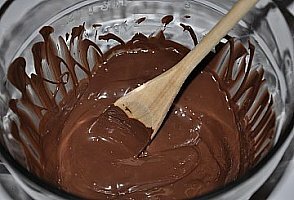 This is a basic way of how to make homemade chocolates. Using candy molds and candy melts makes creating homemade chocolates super easy. It makes a great cooking activity for kids. You can buy any shape of molds you can find at craft stores, cake decorating stores even some chain stores carry them. Candy molds come in any size, for every holiday, have lots of fun shapes and are fairly inexpensive. These are so easy to make and fun for the kids and you, that it is worth having candy molds on hand for every occasion. 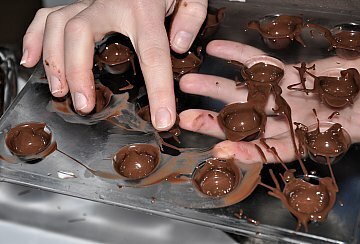 The second thing you need in order to learn how to make homemade chocolates, besides candy molds, is candy melts. These are perfect for shaping chocolates. 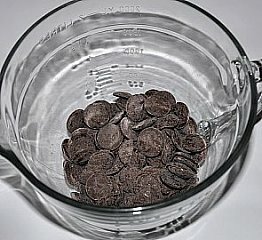 Don't try to use melted chocolate chips as they will not hold the shape and will be too soft. Once you make your chocolates they can be stored in the freezer. These are beautiful placed on a Christmas candy platter with other of your favorite Christmas candy recipes. You can also create these as gifts to give away for Valentine's Day or Easter too. Melt the candy melts in a microwave safe dish for 30 second intervals. Stir and continue to melt. 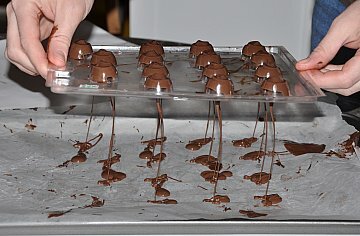 When done drip chocolate into candy molds, with a spoon. Fill to the top. Wipe edges of each mold clean with your finger so there is no more chocolate on the edges. 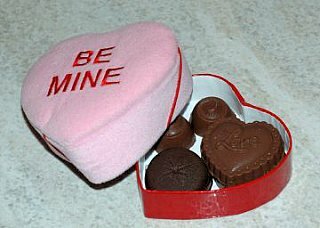 See picture below under filled chocolates. Tap candy molds on counter to get rid of air bubbles. Place in freezer 10 minutes or until under side of mold is frosty. Turn mold upside down on a sheet of waxed paper and molds will fall out if need you can bend and shake mold to get them out. 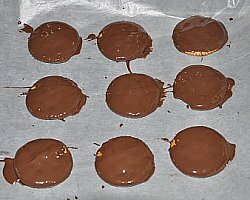 If you have leftover chocolate, place waxed paper onto a cookie sheet and pour leftover chocolate on top of waxed paper. Spread out with rubber spatula. Let sit or chill until firm. Then break chocolate into pieces and store in a resealable plastic bag. You can reuse for another batch of homemade chocolates. Now you know how to make homemade chocolates using candy molds, you can take it a step further by adding fillings or nuts inside. Melt the candy melts in a microwave safe dish for 30 second intervals. Stir and continue to melt. 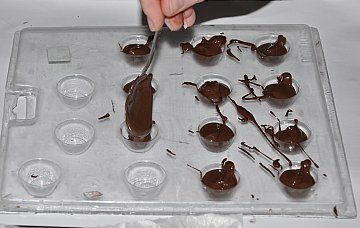 When done drip chocolate into candy molds, with a spoon. Only fill half way. Place a piece of waxed paper onto the counter or cookie sheet. Turn molds over and allow the excess chocolate to drip out onto your waxed paper. Wipe edges clean so you don't have any chocolate around the outside edges. Freeze 5-10 minutes. Fill with an almond, hazelnut or try one of the fillings below. Pour chocolate into each mold up to the top. Wipe edges again. Refreeze. Take out of freezer and pop homemade chocolates out. If you need to you can reheat your chocolate if it hardens. 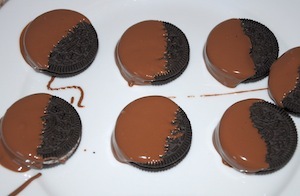 For these fillings you make the recipe and when your chocolate mold is ready add a small ball of filling or spoonful. Make sure you save room for more chocolate that will go over the filling. 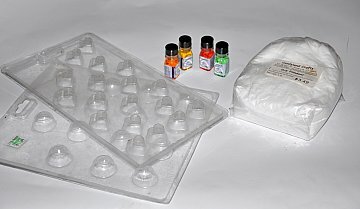 Mix together and use for filling for candy molds or dipped chocolates. Mix in mixer until mixture becomes smooth and can be rolled in a ball. Use for filling in candy molds or dipped chocolates. Mix sugar, vanilla and cream together until forms a dough. Cut a cherry in half and wrap dough around the cherry. Use for filling in candy molds or dipped chocolates. You can buy dry fondant in cake decorating shops. This is how you get chocolates with cream fillings. Use whatever flavoring you like such as peppermint, strawberry, lemon, etc. Little bottles of flavoring for candy is also sold in cake shops. Melt 8 Tablespoons butter, mix with 3 Tablespoons cream and 1 lb. dry fondant. Flavor with a few drops of flavoring and add a little drop of color. 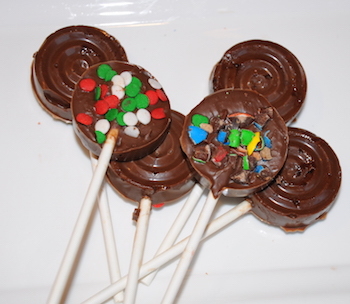 Use filling in candy molds or dipped chocolates. 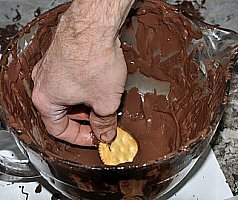 You can use these same melting chocolate instructions to dip fillings (above) or other foods such as strawberries, crackers or pretzels. Prepare your filling or dipping items and then melt your candy melts. 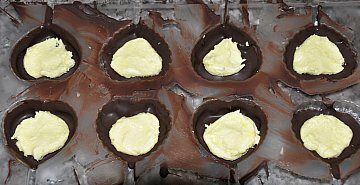 If you are using fillings you can roll a tablespoon or so of your filling into a ball and dip into the melted chocolate. Place on a sheet of waxed paper until firm. Placing it in the fridge or freezer will allow it to harden faster. Melt your chocolate and prepare a cookie sheet with a sheet of waxed paper. Sprinkle with additional sprinkles or mini M&M's if desired. Let set until hardened. Now learn how to make chocolate suckers.